World Marathon Major finish #3 finally came for me this past Sunday at Chicago; actually it’s WMM #4 because I have now run Boston twice (2009, 2010), New York City (2010) and Chicago. It was also my 9th marathon finish overall. All told, it was a very good day, as the stats below demonstrate, but a bit of unfinished business remains. Actually my first Chicago Marathon was supposed to happen a year ago. I had signed up for the 2011 event and had begun training in early summer of that year, but after a hamstring injury, then a knee injury suffered playing soccer, it was just not meant to be. 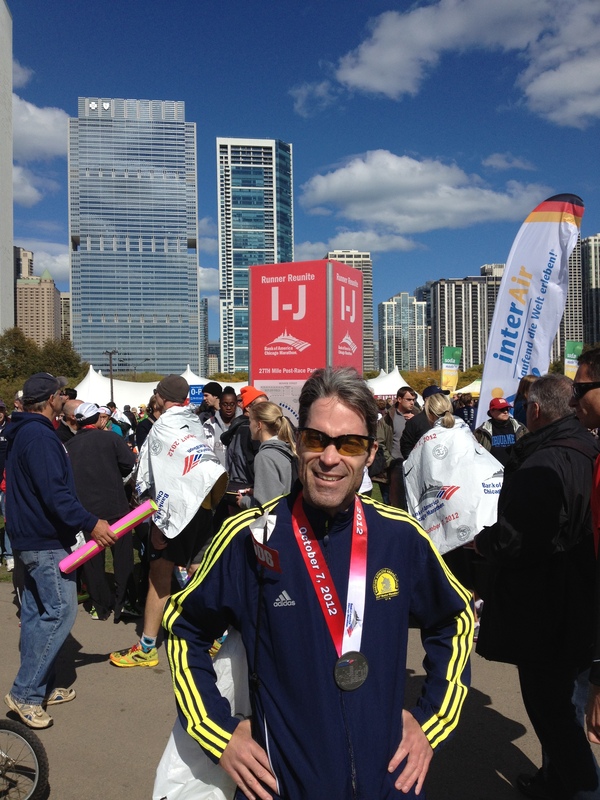 Despite the summer 2011 setbacks, I managed to put together a nice Philadelphia Marathon performance in November 2011 and that gave me encouragement about making another attempt at a Chicago run in 2012. After spending a good portion of the spring and summer of 2012 training for and racing in an Olympic distance duathlon, there were only about 10 weeks available to prepare for this year’s Chicago Marathon. Most marathon training plans are 16 weeks in length. For the first several weeks of this abbreviated cycle I wasn’t so sure I could pull it off. The body needed to recover a bit from the duathlon, and even 10-12 mile long trail runs were a slog during the Northern Virginia dog days and nights. I finally hit the 20-mile long run mark on Labor Day weekend in conditions that could best be described as miserable, close to 90 degrees and humid. But about two weeks later, as summer heat eased its way towards autumn, it all started to click into place. My second and final 20-miler of the cycle was a night-and-day difference as I cruised through it for 19 and then jacked up a fast finish in the final mile. In addition my tempo and interval workouts were now nailing the target paces. Then I topped off my Chicago resume with a solid 5k/10k double performance at the Clarendon Day Races in Arlington on September 23. As I hit the short 2-week taper period, I knew I was ready. 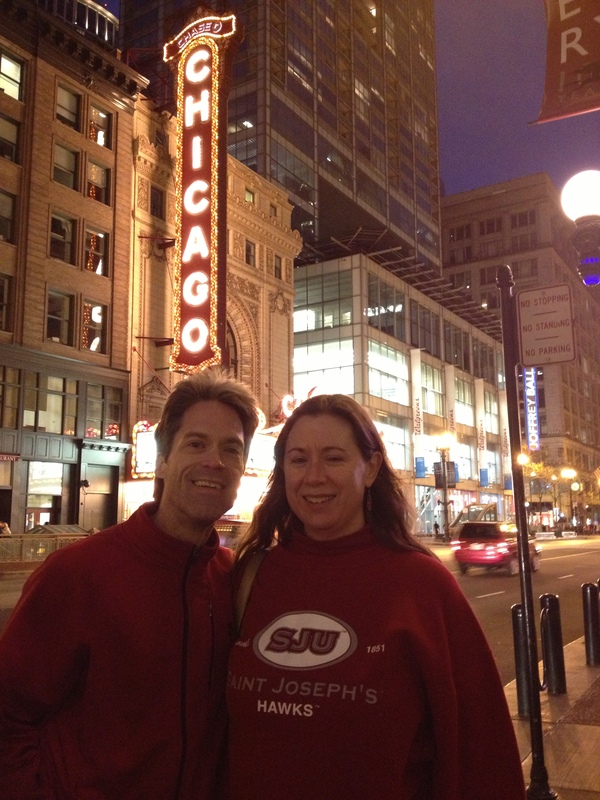 Lynn and I boarded the short flight to Chicago on Friday and before long we found ourselves at the expo. Having gotten that step out of the way, all that was left then was to enjoy a nice dinner and relax on Saturday. We enjoyed the downtown area a bit and that helped keep my mind at ease. As eager as I was to get it on, I was remarkably calm throughout Saturday and I even slept relatively well. Finally the alarm sounded at 5:05 am on Sunday and having planned everything out 24 hours before it was a simple matter of eating breakfast, which ended up being two energy bars, and heading out for the 5 block walk to Millennium Park. The weather was chilly with a bit of a wind blowing but I felt well equipped for the temperatures, with a race outfit consisting of my DC Roadrunners singlet, shorts, arm sleeves, calf sleeves, lightweight gloves and beanie, lightweight merino wool socks and my new favorite shoes, the Skechers GoRun. I had my race nutrition all lined up, too, a Peanut Butter GU for just before the race, then Pineapple Roctane GU for miles 5, 10 and 15, followed by my “secret weapon,” a Honey Stinger Berry Blast gel teed up for mile 20. If an electrolyte boost was to be needed in the final 10k, I’d go with Gatorade since only that would metabolize quickly enough to help at that stage. I said goodbye to Lynn and headed for the gear check, then made it into the B corral with about 2 minutes to spare. The anthem was sung, the wheelchair athletes were off and then it seemed like barely any time went by before the cannon for the rest of us sounded. It took me roughly two minutes to cross the line and I quickly settled into a comfortable pace. 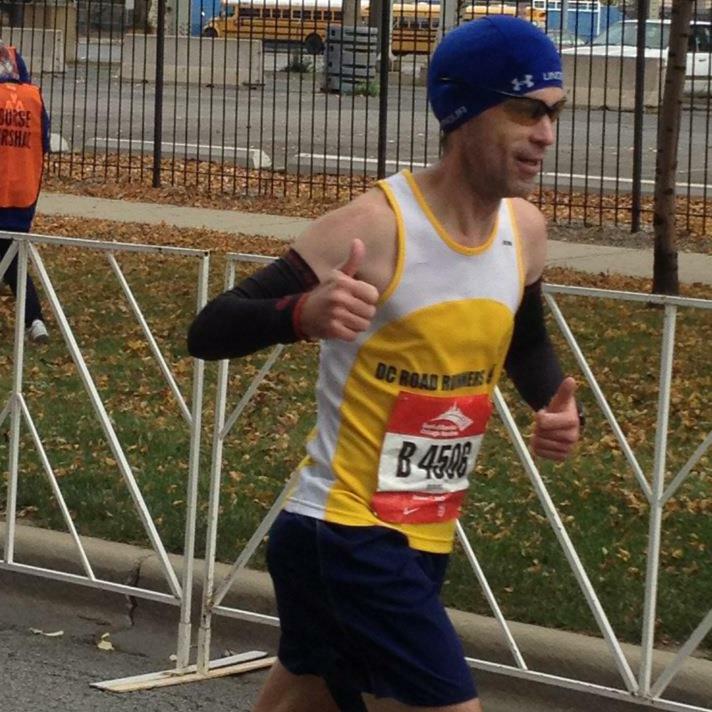 As we proceeded through the north side of Chicago I was pleased with my pacing; it was a little slower than I have taken out other marathons but I was on a sub-3:20 pace that actually felt easy. So I resolved to stay at that level…and not worry about racing until I got to 20 miles. As we headed back south I passed where Lynn was watching but managed to miss seeing her on the other side of the street. I proceeded onward, cruising past the half marathon point in 1:39:27. Perfect, I thought and I felt no signs of wearing down. Through it all it seemed every new street we turned onto bore a new surprise from the crowds. Sometimes it was a band, sometimes a dance troupe, and sometimes a few very amusing signs. It seemed the spectator sign of the day was “Worst Parade Ever.” Finally at 17 miles I got to see Lynn, still feeling great and thinking about dropping the hammer in a couple of miles. Before long that 20-mile mark came up and I pulled out that Stinger gel, downed it with some water and said “OK, it’s go time.” In retrospect it’s a good thing I did step up my intensity because it turned out I was slowing down, just a little bit, despite the fact I was now starting to pass other runners in large numbers. Still I felt strong. I saw Lynn again at mile 23 and couldn’t help but smile because I knew I was having a great run. The only question was could I hang on, or was a crash lurking in the darkness. I worried about that a little bit as the 24-mile mark approached, when I felt my right calf starting to really tighten up. Luckily the aid station was only about 400 meters past that; once I got some water in me the developing cramp went away. As 25 miles approached I knew it was time to go for broke with whatever I had left. I continued to be the hunter, passing other runners in droves and in the distance I could see the final turn towards the finish. I knew the 3:20 plateau I have been staring at for 5 years was probably going to live another day (darn it!) but a PR (3:20:40) was still in reach. As we turned turned towards the lake we were greeted by something we hadn’t really seen all day on this course: a hill. That seemed a little cruel, especially as I was now trying to imagine myself as a half-miler rather than a marathoner. It was really hard to get it going up that hill which continued to climb past the 400-meter-to-go point. Finally with 300 to go it crested and the last 200 looked to be a downhill sprint. I gave it all I had from that point, dragging a couple of other runners hoping to draft off of me. As I approached the arch I couldn’t believe my eyes, which were witnessing the excruciating march of time. I finally lost sight of the clock as it clicked to 3:20:38. I had no idea if I would make it at this point…but I had a feeling, later confirmed, that I had come this close. As I crossed the line I initially felt frustration over having come so close, after running such a great race, and it seemed incomprehensible that I could come away without at least a new PR to brag about. I had missed it by 2 seconds, finishing in 3:20:43. How on earth could a race so long come down to 2 seconds?! But as I had the medal put around my neck, my mood quickly changed. I had achieved some great things today, beyond just a marathon finish. The stats clearly showed that this had been my most evenly paced marathon ever, with a mere 2:14 positive split, compared with that PR day in Boston where my positive split had been about 10 minutes. Moreover, my training, which had consisted of lower mileage than any previous cycle and relied heavily on cross-training, had worked. I felt strong for the entire race. And I raced well, focusing on the my surroundings and tactics instead of being a slave to my watch. PR or no PR, it could be argued this was my best marathon ever. And let’s not forget, it was yet another BQ result, one that punches my ticket for eligibility up to Patriots Day 2014. As I reunited with Lynn and we enjoyed a Goose Island 312 in the post-race party zone, I basked in the sunlight and satisfaction of a job well done. In the coming weeks, I’ll have plenty of time to evaluate how to build on this performance and get off the 3:20 plateau at Boston in the spring. Lots of ideas are on the table, like maybe getting a coach, but no decisions yet. In the meantime, I will enjoy the accomplishment, hang my hat on consistency: 5 marathons of my 9 have fallen between 3:20:41 and 3:23:52. And that’s a good platform from which to jump to the next level. Great job on a great race! Imagine what you can do with a full training season. Go get it this spring! In the meantime, enjoy a very successful race and recover well. Thanks, Mindi. I do have the half at Philly next month to complete my fall season, but already I am thinking about Boston. I’ll rest most of December but come January, it’s on!